90 Day Challenge: Day 6 | Kay Rice, M.Ed. Last night after breaking into my EFK (Emergency Food Kit) items for dinner, and finding more sneaky sugar in my pantry, I resolved to do a little bit better with meal prep and cooking creativity. Additionally, I think finding pure cane sugar in my 100% Natural, Organic Vegetable broth kinda ticked me off. I mean, seriously? Why would I want sugar in my Vegetable Broth? So—today I made my own broths! It rained most of the day and there were few vendors at the farmer’s market this morning. Still, I got what I needed for cooking. After my stop at the farmer’s market I went to the grocery that caters to the hunters and locals and talked with the butcher. I wanted some information on where they get their beef and beef bones and I had some questions about fats (more about animal fats later). They sell marrow bones there, and even though they were not from 100% grass fed cows, it was the best I could do for today, so I purchased them. 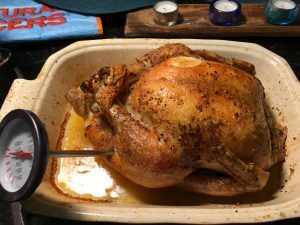 I did better with my chicken, I had a 100% cage free, natural organic chicken in my freezer. Generally I shop on one day and do meal prep the next, but this time I did BOTH! There’s a review on some of the products I’ve been using below. If you are interested in finding out more or purchasing any of those products, I’ve listed several resources for you. If you click on a link, I want you to be aware that I may have an affiliate relationship with that company or product. Meaning, if you click on a link and purchase the product I may receive a small commission. This helps pay for the 90 Day Challenge. Just so you know I will never recommend an product or encourage you to purchase it without an honest review. I’ll tell you up front what I think about it, whether I genuinely liked it (or not), and do my best to give you purchase options so you can find the best deal. 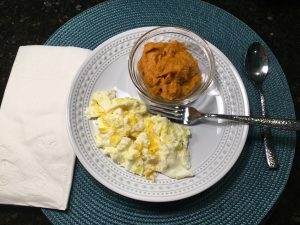 Those whipped sweet potatoes with the pumpkin pie spice are so sweet and delicious that I don’t mind giving up oatmeal, toast or any other grain for breakfast. Paired with some scrambled egg & egg whites I was happy, satisfied and fueled up for some morning shopping when the Farmer’s Market opened. Where are my macro-nutrients in this meal? I mentioned that I was determined to improve both meal prep AND that I wanted to have my own broth for cooking. 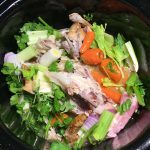 Bone Broth—not just stock—has some very good benefits and has been used as medicine since ancient times. It has tons of minerals, collagen and more good things. 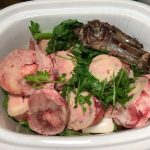 I’ll put more information as well as the details on preparing bone broth in a separate post so you can download it if you wish. So, in addition to picking up produce at the Farmer’s Market, it was off to the local butcher to ask some questions about my options for bones, in particular beef bones. I purchased about 3 pounds of marrow bones and she recommended adding a few back ribs for flavor as well. While I’m making broth, I’m going to make lots of broth. 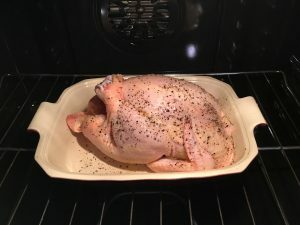 I thawed out a chicken to roast from Parker Family Farm, where they raise 100% Pasture Raised chickens, turkeys, pigs and more, all fed a natural and non-GMO diet. 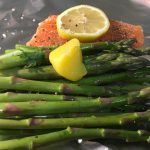 After popping that chicken into the oven to start roasting, I made a couple of Salmon & Asparagus Packets. One for lunch & one for later. That’s wild caught Salmon along with half a bunch of asparagus, lemon, salt pepper and a tad of ghee on top. Toss it on the grill or pop it in the toaster oven at 425° for about 22 minutes and you’ll have a quick and delicious meal. While my packet was cooking I boiled a white potato to go round out my meal. Remember? 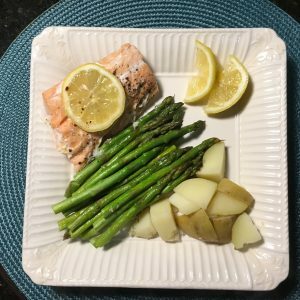 This meal was the comfort food I was craving yesterday! 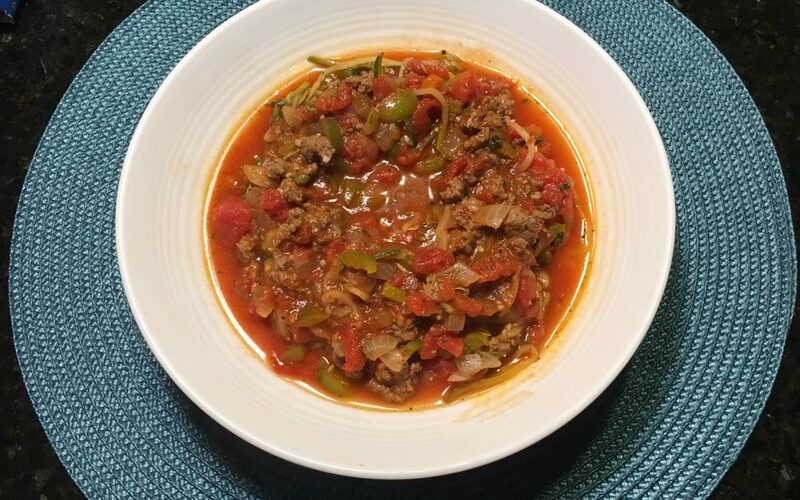 This has 8 ounces of ground beef, green peppers, garlic, Italian Seasoning mixed with a zucchini that has been steamed with a can of Fire Roasted, Diced Tomatoes and some chicken broth. It made 2 very generous, filling, high fiber meals for me. One for now—one for later! I’ll add the Recipe for this. If it isn’t here when you read this post, then come back later. 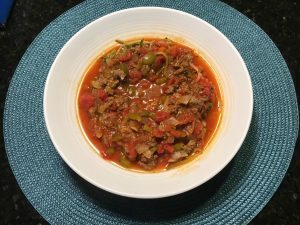 It’s a good thing for me to post the recipes, because in general I sort of cook “on the fly” and I may never make the same dish quite the same again. Fat: Ground Beef: and I drained all the fat off of the meat after browning it. Frankly, while I was doing meal prep and taking the meat off the bone of the chicken I sampled a little. Between that and the very filling dinner I had, I really didn’t want to eat again in the next four hours. However, I was up late and got a little bit hungry, so I took the back rib out of the bone broth that was still simmering and ate the meat off of that. Where are the macro-nutrients? Protein & Fat: They are both in the beef. Carbohydrate: I skipped that. 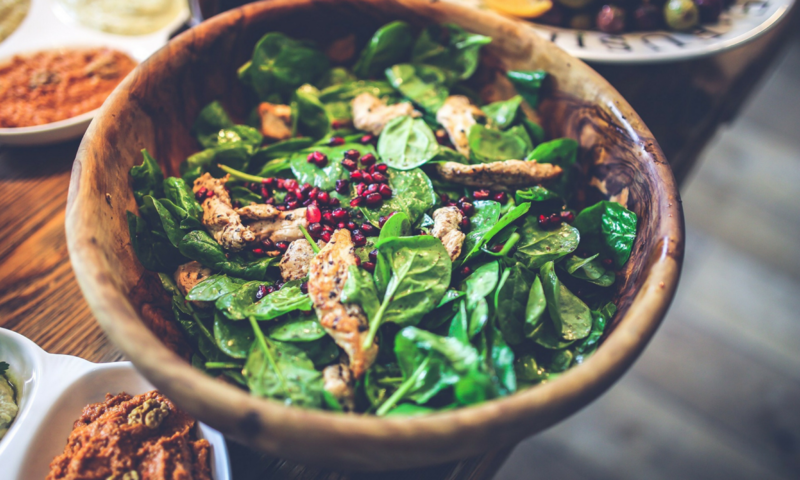 Actually, if you are not hungry at the last meal of the day, it’s okay to eat half a meal or just your protein and fat and skip your carbs. I want to show you just how easy it is to cook and prepare in advance for a week with a “Meal Prep Day”. It really will help you set your week up for success. After today, I have 10 meals in my refrigerator that I have the basics for and can pull out and have ready in under 5 minutes, and some of them I can carry with me. Not only that, by tomorrow I’ll have both chicken and beef bone broth which I can freeze and have available for a few months, as needed. Look how far one little chicken can go! Here’s that chicken I roasted. I popped it in the oven for 90 minutes at 425° with just a little salt, pepper and cooking fat on it. Check the temp to make certain it is done—it should register 160°. This chicken could have been removed a little earlier, but it was still tender and moist. After cooling the chicken, I removed the legs and thighs for another recipe later in the week. 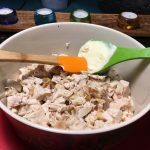 I weighed the remaining meat, primarily from the breast and portioned it out in 4 ounce servings and added 1 Tablespoon of Primal Kitchen’s Mayo to each serving. I packed each serving in a small mason jar to use later in the week, and I can add any variety of things to each serving to make it different. Ideas? Chicken Salad with a small handful of dried cranberries and tarragon for one. Or how about 1/2 a chopped apple & some raisins. Then there is the classic chicken salad with some finely diced celery, onion and dill relish. The possibilities are infinite! Just use your imagination. I did a “taste test” between Primal Kitchen’s Mayo made with Avocado Oil and my home-made version with Light Olive Oil—mine wasn’t bad, but theirs won, hands down. It was lighter and had a better flavor. You can see a difference, too. Theirs is whiter and my home-made version is a little more yellow. I don’t use a lot of mayo, so even though it is more expensive, I think it is worth it. 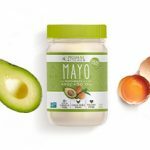 I’m adding both their regular Avocado Mayonnaise AND their Chipotle Lime Mayonnaise to my list of kitchen staples. Remember from a few days ago when I tried the Chipotle Lime Mayo? It was a definite YES, I LOVE THIS! If you would like to try my home-made mayonnaise click here to get my Mayonnaise Recipe. 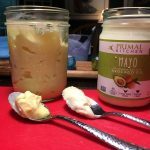 If you’d like to try Primal Kitchen’s Mayo, Where can you get Primal Kitchen’s Mayonnaise? 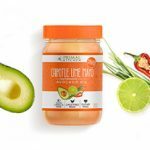 You can order a Primal Kitchen Mayo Combo Pack from Amazon.com and they are also available at Barefoot Provisions, or from Primal Kitchen (use the coupon code GROK15 to get 15% off your purchase from Primal Kitchen). Here’s what it looked like when I was finished with my chicken meal prep. 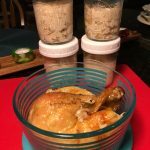 I had two legs and thighs cooked and ready for a future meal, plus 4 portions mixed with mayo packed in mason jars which can be grabbed in a minute for a meal on the go, or packed in a lunch to take to work or school. And with the left over chicken carcass I had the base for my chicken bone broth. I won’t have to make broth again until sometime in the Holidays, for sure! Since I was chopping onions, carrots, leeks, celery and cilantro (or parsley) for chicken broth, I figured I may as well use the rest and make beef broth all at once. Seems like less work to me than going through the entire process again on another day. 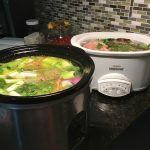 I used crock pots for preparation because a true bone broth (as opposed to chicken or beef stock) needs to simmer for 12 to 24 hours). In addition to the vegetables I added to each crock, I added seasonings of my choice. I put poultry seasoning salt and pepper in the chicken pot, and thyme, a bay leaf and pepper in the beef pot. I’ll leave it to your discretion as to how how much and what spices you might add to yours. 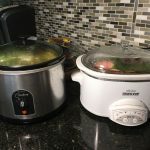 I added filtered spring water to the top of each crock and then cooked them on high until they were boiling and then turned them to low overnight. This morning, I let them cool then removed the bones first, then the vegetables which I mashed to extract as much liquid as possible. Finally I poured them through a strainer lined with cheese cloth into bowls to let them cool completely. I’ll skim any fat off the top before packing them into containers to be used later. Keep in mind your container sizes when you freeze your broth and how much you might want to use at a time. It may even be helpful to freeze some in ice cube trays and then store the frozen cubes in freezer baggies so you can toss one or two cubes into a recipe as needed without having to thaw out a whole quart. 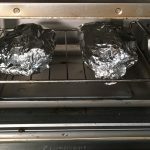 I put out a sheet of aluminum foil for each packet I was preparing. 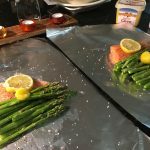 Then I put a salmon fillet on each piece of foil and topped it with a lemon slice. Then I took a pound of fresh asparagus and chopped the tough ends off and divided the asparagus between the two packets and put a small amount of ghee or clarified butter on top. I added salt & pepper to taste then sealed the packets. I cooked mine inside today in my toaster oven for 22 minutes at 425°. You can cook these on the grill, too. So there you have it! Well, actually I have it! 😉 I ate great today, and prepped 8 additional meals for later in the week and have my own home made broth to use over the next 3-4 months. Please post any questions, comments or ideas that you have below! I love hearing from you. And please fill out the form below to get updates and information on when the next 90 Day Challenge will officially begin. You will be the first to know and have access to all the new resources and support available to help you reach your goals!